1st row: Arlene Rowe, Linda Gollinger, Patricia McCollum Matejcik, Connie Hickok, Sheryle Dana, Suzanne Bushaw, Christine Bigwarfe, Joyce Ashlaw, Marsha Hance. 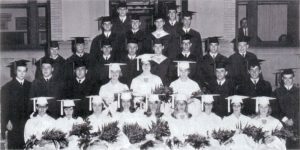 2nd row: Barry Strate, Charles Tupper, Thomas Collett, Dorothea Morse, Linda Hutchinson, Kela Guiles, James Gagnon, Karl White, John Lozo, Glenn Loop, Arnold VanBrocklin, Michael Whitmarsh, Ronnie Bice. 4th row: Douglas Beachard, Douglas Whiteford, David Brassard, Phillip VanBrocklin. 5th row: Roger Willard, Garnold Hance.